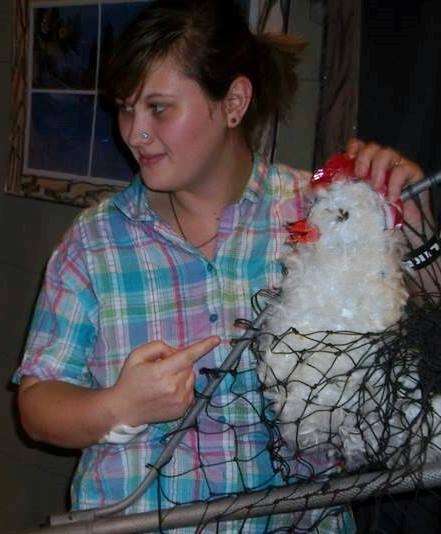 In November, I was asked to make a chicken and a juke box for the Christmas play put on by the Pathway Community Church youth. I roughed out the chicken before I left for two weeks in AZ, visiting my daughters families in Chandler and Show Low. After returning, I decided the old stage, made of burlap painted to look like a log cabin interior, needed to be replaced. It was too messy, shedding burlap with every move, and allowed back stage actors to be seen through the walls when backlit. Plus, it needed to be pinned onto the pvc stage framework every time it was used because there were no casings sewn into the wall panels. Almost all the materials for the new stage were donated by local businesses: several used flat sheets from local motels, plywood for the wooden bases from builder Rodney Roberts, and holes drilled in the bases by Buckeye Hills Career Center. 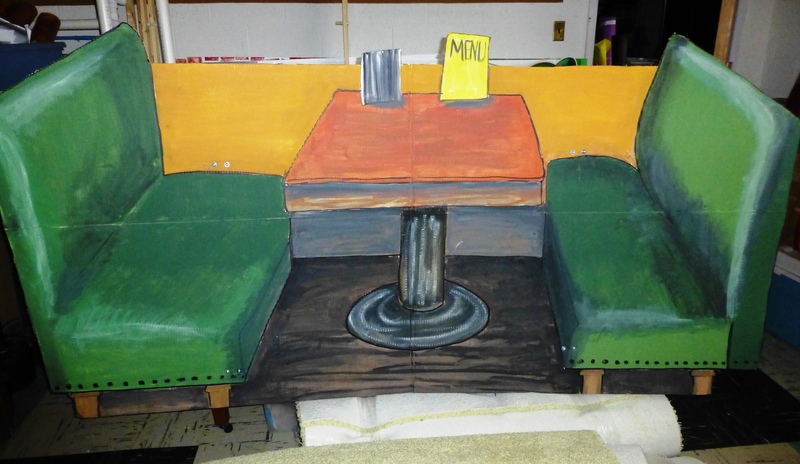 Large sheets of pristine cardboard for scenery was donated by furniture maker Lee Bauman. 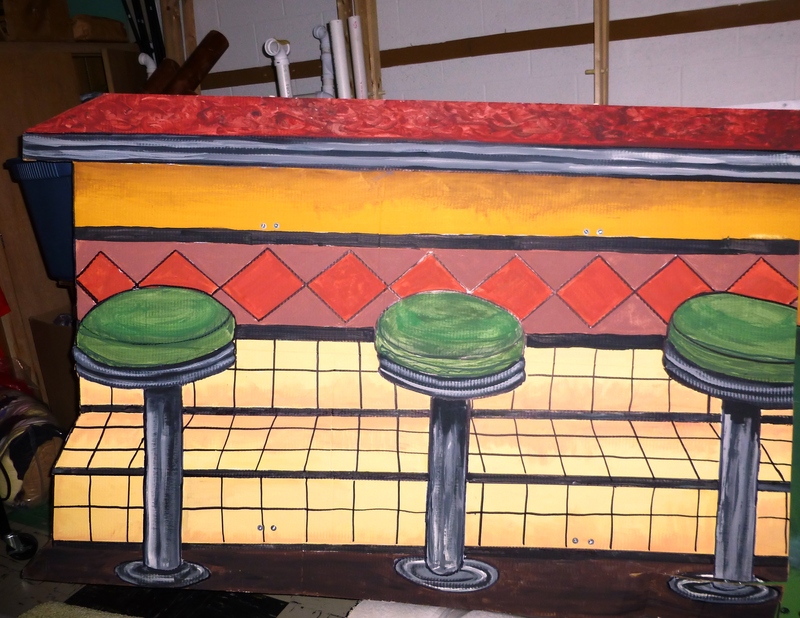 I turned final finishing details of the chicken and jukebox over to others. 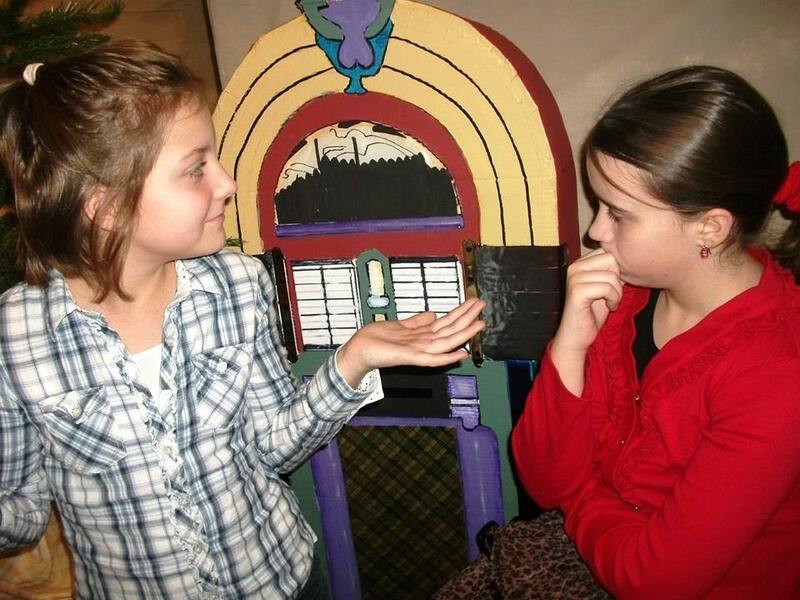 The chicken grew feathers and the juke box sported bright paint, thanks to Donna Mullins. Meanwhile, I began sewing the sheets together, creating casings at the top of the wall panels to hang from the pvc pipe framework. A friend, Mindy Allie, gave me free run of the room above her garage to paint the sheets a light brown to strengthen them and create the neutral background needed for the café and future plays. Researching for the interior of the café, I decided that the local 50’s café Park Front Diner in Gallipolis would be my model. I traced the enlarged photos of the counter and booths onto a page protector, simplifying the design somewhat. I used an overhead projector to transfer the lines to the primed 4′ x 8′ cardboard panels and painted them in an orange, brown and green color scheme, given that Cricket County is a rural kind of place, after all. Park Front’s trendy hot pink, black and white wouldn’t work. Here are some photos of the play with country and city cousins in the midst of their own brand of Christmas craziness, but with a message about Jesus and the Gospel to cap it off. Entry filed under: Uncategorized. Tags: Christmas Play, Cricket County, Diner, Parkfront Diner, Pathway Community Church, Stage Set Construction, Youth.